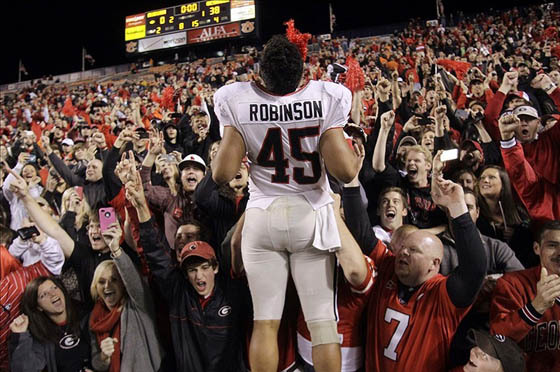 Georgia crushed Auburn 38-0 Saturday night and at the the same time clinched the SEC East title. The Bulldogs will play in the SEC Championship Game on Saturday, Dec. 1. It was the second straight victory over Auburn for the Dawgs, and both were in convincing style. Georgia has now outscored Auburn 83-7 in their last two meetings and have evened the overall series at 54-54-8. Aaron Murray led the Bulldogs by completing 18-of-24 passes for 208 yards and three touchdowns. He completed TD passes to Tavarres King, Malcolm Mitchell, and Chris Conley. King led all UGA receivers with three receptions for 73 yards and a touchdown. Mitchell had five receptions for 47 yards, while Conley added four catches for 32 yards. Arthur Lynch, Jay Rome, and Todd Gurley also caught passes for the Bulldogs. Gurley led the rushing attack for the Dawgs again, compiling 116 yards and a touchdown on 11 carries. Keith Marshall also broke the 100-yard barrier with 105 yards on only eight carries, including a 62-yard run for a touchdown. Overall, Georgia amassed 497 yards of total offense against the Auburn Tigers. Meanwhile, the Georgia defense held Auburn to only 238 yards and shut them out on the scoreboard. Georgia will likely face Alabama in the SEC Championship Game. The Crimson Tide (9-1, 6-1 SEC), currently the consensus no. 1 team, lost on Saturday to Texas A&M. Next Saturday, the Bulldogs host the Georgia Southern Eagles at Sanford Stadium. The game will be televised by WSB-TV Channel 2 (Atlanta) at 1:30 p.m. ET.